Experts in Web 2.0, we provide development and consultancy solutions. If your software project requires someone to get stuck in to the code, or simply need some help with the planning and architecture, why not get in touch to see how we can help. Chris Worfolk is a highly accomplished software developer who has over ten years experience building web applications. He previously served as Lead Developer for Buzz Sports, a leading online gaming company and his previous work includes projects for the NHS, Asda, Fujitsu and Starbucks. We offer translation between English, Finnish and Swedish, all done in house by our highly skilled translator. Contact us for more details. Below you can find our WordPress templates which are free to use on your own blog. Originally developed as a light magazine style look for a gossip blog it features a pure CSS three column layout with the main posts on the left and a side section on the right with two columns for the various site links. Recent posts and comments are a great item to add to these columns. There is a search bar at the top. 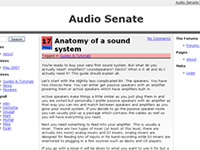 Originally developed for the re-launch of Audio Senate as a music blog it consists of a three column CSS layout with navigation bars filling each site with links to the blog and what would have been the rest of the Audio Senate network and the posts in the middle. It is a simple clean design with the occasional splash of colour to liven it up a bit. We have years of experience developing highly scalable, low latency, mission critical web applications. Contact us to see how we can help you with your next project.